When you see a part of your house that needs painting, the natural inclination is to just jump in there and get it painted. You may clean off the surface a bit and make sure you are using the right paint, but other than that, most people just start painting the surface after taking minor measures to ensure they are doing it right. What they may miss out on is the fact that wood surfaces need to be thoroughly prepped before you can expect paint to stick properly. Wood can rot over time, and this is the biggest reason why wooden surfaces need special preparation. If you paint over rotten wood, then that rotten part of it will deteriorate over time and take your paint with it. You will be left with peeled paint and gaping holes that are a pain to fix up. You need to get rid of the rotten parts before doing any painting. That could mean replacing a large portion of your home’s exterior or interior walls. However, if you do not take the time to replace or remove the rotten parts, you will be wasting your time by painting over them. You also need to consider that wood can get kind of rough over time, especially the wood on the outside of the house. It can be weathered and become incredibly rough, making it very hard for paint to stick to it like it should. That roughness can also make it difficult for you to paint smoothly over it. You can end up with rough looking, uneven patches of paint that stick out and make your house look unsightly. These tend to peel off or crack quickly, and you will simply have to repaint there later. You want to take the time to prep the wood, and that often means sanding it down, especially if it has become rough. If you see rotten boards or sections, then they need to be completely replaced. You don’t have to worry too much about the colour of wood you are using, so long as it is of decent quality. You will be painting over it anyway. Just make sure that whatever wood you use is prepared properly as well. Just because you bought the wood new, that does not mean that it is ready for you to paint over it. It may need to be sanded as well. Very rough sections may need extra paint, or some caulking put in to fill holes. Certain kinds of wood are more likely to have spaces of holes that you need to fill in before you paint. You want a relatively smooth surface to paint on, but that’s not always possible. Just make it as smooth as you can, within reason, and then use paint that is designed to be applied to wood. The results should be fantastic, if you followed these guidelines. Painting your own home’s interior can be incredibly rewarding, but it can also be messy. That’s why we put together this list of tips to follow as you do the painting yourself. You don’t have to hire an expensive professional to paint your home, but you should know the best way to work efficiently and not end up with a big mess afterwards. Most people will buy plastic drop cloths when they paint their home, but that’s not necessarily a good idea. Plastic cloths will keep the paint wet for longer, making it much harder to clean up and often resulting in big mess when you move around on the cloths or try to remove the drop cloth. Even using newspapers can be a bad idea as they can become scattered too easily and they can expose parts of your floor as you walk across them. Like plastic, they can be slippery, and you may be putting yourself in danger if you place a ladder on top of them and expect it to be stable. You are better off going with cotton drop cloths. Even though the may be slightly more expensive, they are a good investment. They will leave you with less of a mess to clean up and a safer work environment. How do you store your rollers and brushes when you are finished with them? Do you carry them all the way to a sink to clean them off or do you just set them on the floor until the next time you paint in that room? It’s better to keep a bucket or some other storage container in the room you are painting in. Then you can transport the brushes and rollers to where your want to clean them and prevent them from dripping all over the house. By having a consistent storage area for them, you can reduce accidents and find them faster. You won’t be tripping over them or making a mess on your clothes as you step on them accidentally either. Once again, this may cost you slightly more than other methods of handling your paint brushes, but you can save money over time this way and work neatly and more efficiently. Sometimes, you may want to add some water to your paint to make it spread easier, but you need to avoid the mistake. Most modern paint does not need any additional water. It is meant to be thick enough to dry quickly and stay on your wall for a long time. If you add water, you can keep it from drying properly, cause it to run and leave behind uneven paint on your wall and dilute its effectiveness at sealing and preserving your wall. 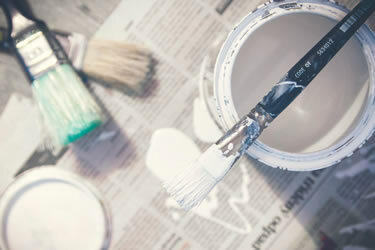 You might be tempted to make the paint last longer and go farther by adding water, but you will only be wasting the paint and making a huge mess when you try to apply it. In What Order Should You Paint Your Home? So, you are looking to paint your house and you want to make it look as good as possible. You want results you will be happy with, and you want to ensure that you don’t regret the final result. You may have big plans on what to paint, but you may not know where to start. You may not even know if there is a right place to start painting or a right order in which to paint everything. Well, there actually is, and we are going to show you the correct order to paint your house. If you are doing an exterior paint job, then you should start with the roof first. Always start with the upper sections before moving onto the lower sections. That’s because the work you do above can bleed onto the lower sections and make them a mess. You will have to prepare the walls before you paint them, so make sure you paint above them first. That way, you save time and only have to do the prep work once. The roof is also the most important part of the house to paint, as it protects the rest of the house, keeping out water and pests, so painting that first allows you more safety in which to paint everything else. If you are painting an interior room, then you should begin with the trim, move to the ceiling and then do the walls. In this order, you save yourself the most work. The trim is the easiest part to tape off, so you want to get that out of the way first. It can be tough to paint the trim and not get any paint on the walls and ceiling, so painting that first allows you to move quickly and make a bit of a mess. 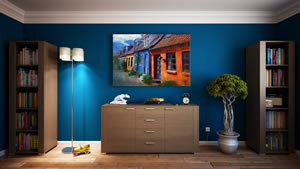 You can always paint over your excess paint later as you are doing the walls and ceiling. Painting the ceiling before the walls ensures that you don’t make a big mess on the walls you just painted. It also prevents leaks and other problems that can harm your wall paint job. Treat any fixtures in a room like trim- paint them first. So, if you are painting the bathroom, you want to paint the sink, vanity and other fixtures before doing the walls or ceiling. You can do the trim at the same time, though. Then just cover your fixtures as you paint the rest of the room. If you are painting the kitchen, then do the cabinets and other fixtures first, before you do the walls or ceilings. Once again, you can easily cover them as you paint the rest of the room. Speaking of a great exterior home painting services in Dublin. The goal with these painting methods is to save yourself some work. You paint the small details first, as those can be covered up easily. You can’t easily cover up a wall or the ceiling, so you save those for later. Working this way should prevent you from making a mess that’s tough to clean up and will allow you to work more efficiently. Have you ever finished painting a room or a wall and then looked over your work and noticed that the paint didn’t look very consistent? Maybe the strokes were showing, and you could see that you had painted in different directions. Perhaps the colour was inconsistent, and you felt like you had to repaint everything to make it look uniform. If these problems have ever happened to you, then we have some suggestions that can help for the next time you are painting. If you are going to use multiple buckets of the same colour paint in the room, then you should mix them all together into a larger bucket. That’s because paint colour can vary slightly from one bucket to the next. It happens more often than you might think, and to avoid having multi-coloured paint on your finished walls, you can simply mix all the buckets of paint you will be using into one bucket. You may need to buy a larger bucket in order to do that, but if you take a little time to mix it all together, you will get a consistent colour that looks great when you are finished. Whether you are painting with a roller or a brush, you should keep it wet as you paint. This prevents dry, crusted paint from coming off onto the walls and creating a bumpy look to the finished work. If you keep the brush wet, then it will allow paint to go on smoothly and coat properly. You can end up with lap marks if you paint over dried paint, as you end up layering wet paint over the top of it and creating an uneven surface. 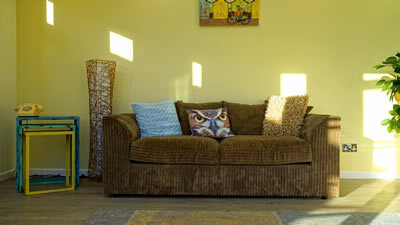 By painting one wall at a time and painting when it is still wet, the paint will layer evenly and not lap. As you paint from top to bottom (which is the right way to paint), be sure to paint the full height of the wall. The is especially important if you are using a roller. You may be tempted to paint from shoulder level and up along the length of the wall, but this can give you two separate layers of paint that stand out from each other when the work is done. Instead, start at the top and paint all the way down the walls, then move over slightly and do it again, all the way down the wall. This is called painting the height of the wall, and it allows you to apply paint in an even and consistent manner.. These are some of the best tips we can get about keeping your paint looking consistent. If you have tried to paint before and were not pleased with the results, then you should employ these methods next time. You will be much happier with the finished result, and while it may take a bit more time, it is definitely worth it for a better looking home.